Available in Spider version 2012.10 or above. 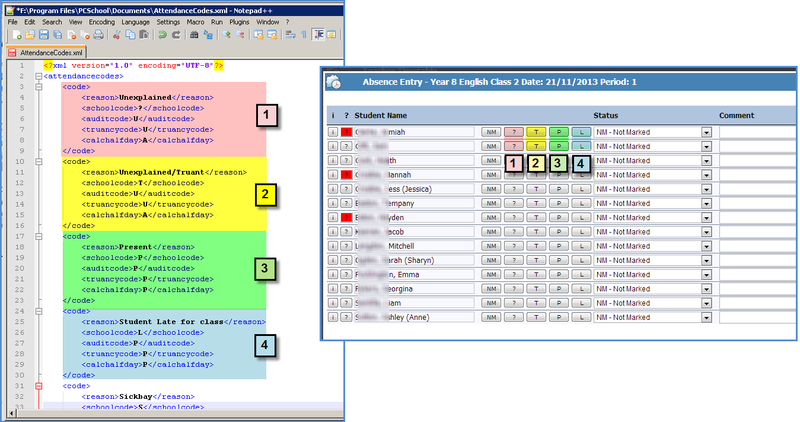 PCSchool allows schools to select which Absence Code / Status to use as the shortcut buttons in the Roll Marking / Absence Entry screen in Spider. The Spider will pick up the first four codes from the attendancecodes.xml file found in the PCSchool\Documents folder on the server. To change the codes or the order of the codes simply open the attedancecodes.xml file in note pad and re-arrange the codes so that the four you want as default buttons are at the top. NOTE: The NM button for ‘Not Marked’ is hard coded and can not be removed. First four (4) codes in XML file will show as buttons in Spider Absence Entry. This entry was posted in Attendance, Behaviour & Attendance, Configuration, Spider and tagged Absence Entry, Attendance, Classroom Management, pcschool, Roll Marking, school administration software, School Administration System, School Management Software, School Management System, school software, Spider Attendance, Student Information System, student management Software, Student Management System, web spider by studentmanagementsoftware. Bookmark the permalink.